Staff from Charles Sturt University (CSU) in Port Macquarie welcomed delegates from the NSW Ministry of Health Senior Executive Forum on Thursday 30 November as part of CSU’s commitment to industry engagement. 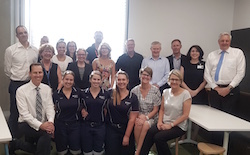 An opportunity to showcase the paramedic facilities and the wider Port Macquarie campus, the visit was arranged by Mr Stewart Dowrick, chief executive, Mid North Coast Local Health District and Chair of the Senior Executive Forum. A number of CSU staff were involved in the visit including Professor Heather Cavanagh, Head of Campus and Bachelor of Clinical Practice lecturers Mr Philip Ebbs, Mr Adam Diamond and Ms Natalia Bilton. Also in attendance was CSU Office for Students’ Indigenous Academic Success Coordinator Ms Shaarn Hayward (Whitehouse). The delegates from the Ministry of Health included the Secretary of Health, the Deputy Secretaries within the Ministry of Health, the Chief Executives of the Local Health Districts and affiliated health networks, the Chief Executives of Health Share and Health Support.